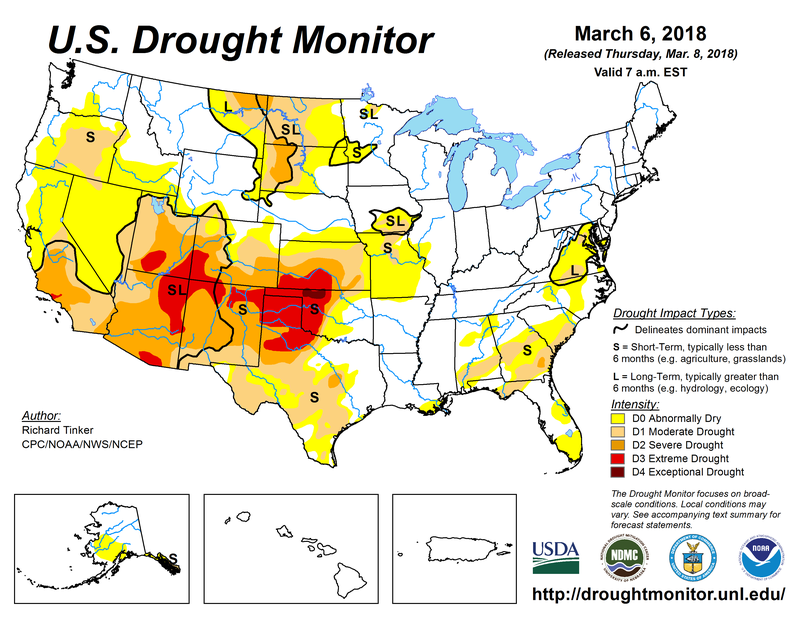 US Drought Monitor March 6, 2018. The latest round of Pacific storms across the western U.S. has helped put a small dent in the overall U.S. drought situation. Moderate to exceptional drought now covers 30.6% of the Contiguous U.S., a drop from last week’s 31.3%. Extreme drought on the other hand, has increased from 3.2% to 4.8% and some of that increase continues to haunt the drought stricken Southwest. During late February and early March, a very energetic jet stream finally took a dip to the south along the west coast opening the door for cooler than normal air to flow across the region. Along with below normal temperatures came a train of weather systems lined-up one after another, to bring rain and snow from central California to the northern Rockies. Despite the active pattern in some areas of the west and northwest, many of these east moving systems have been drying out as they crossed the Rockies, leaving much of the Southwest and central and southern Plains with below precipitation averages. Further east, lows and fronts moving in from western Canada where able to contribute with above normal rain and snow in several areas east of the Rockies. On a positive note is the late season rain and snow arriving in California. Snowpack across the state has increased close to 80% during the week of February 26th to March 5th. Despite the good news, overall values are still at a very low 37% of normal for this time of year. In other words, rain and snow from the latest sequence of storms has been highly beneficial, but we are still a long way from where we should be and time is running out as the active stretch of the precipitation season comes to an end. Further west, the Rockies are also experiencing below average snowpack conditions across a good number of river basins. Overall the Basin shows a snowpack that is 68.5% of the average for March 12th. Several sections of the southern half of the Basin are below 50% and the trend is looking very much like that of 2012, one of the latest worst snowpack years in the region. Water from the Upper Colorado River Basin is essential for farming and agriculture in the southwest, but also for the millions of people that use its water for domestic purposes. Close to 18 million Los Angeles residents depend on snowfall in the central Rockies, and there is growing concern on how the rest of the precipitation season will evolve. There is good news for the drought scenario in the southwest during the last stretch of Winter and the early stages of Spring, because models forecasts are anticipating additional Pacific storms to roll into the west coast this weekend. Some of the action will extend as far south as southern California, with more rain and additional feet of snow in the Sierra Nevada´s. There is a good chance temperatures will continue below normal so that should help lower snow levels across much of the west from the Cascades and Sierra Nevada´s into the Rockies. Below normal temperatures should also help the snowpack stay put and not melt away rapidly. A slow melting snowpack is always more beneficial for the overall water resources.